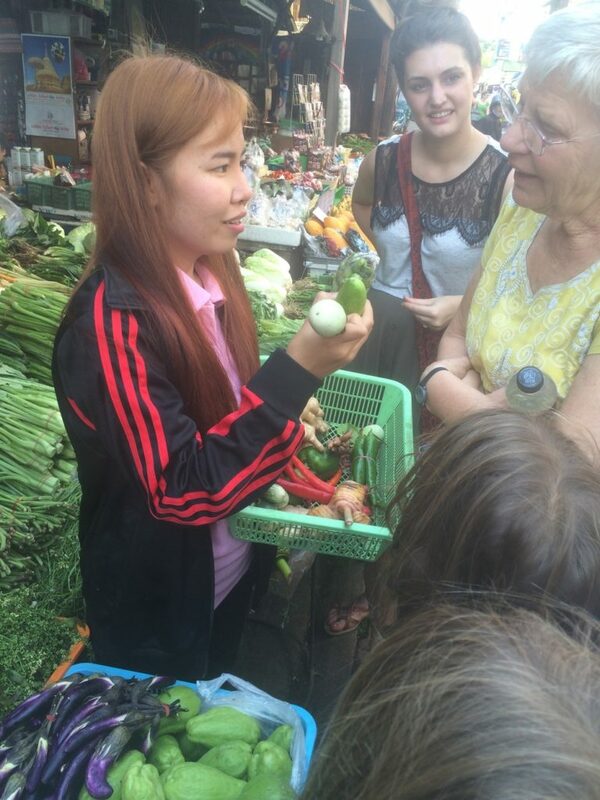 On our only full day in Chiang Mai city we tried, unsuccessfully, to explore Old Chiang Mai before our cooking class. 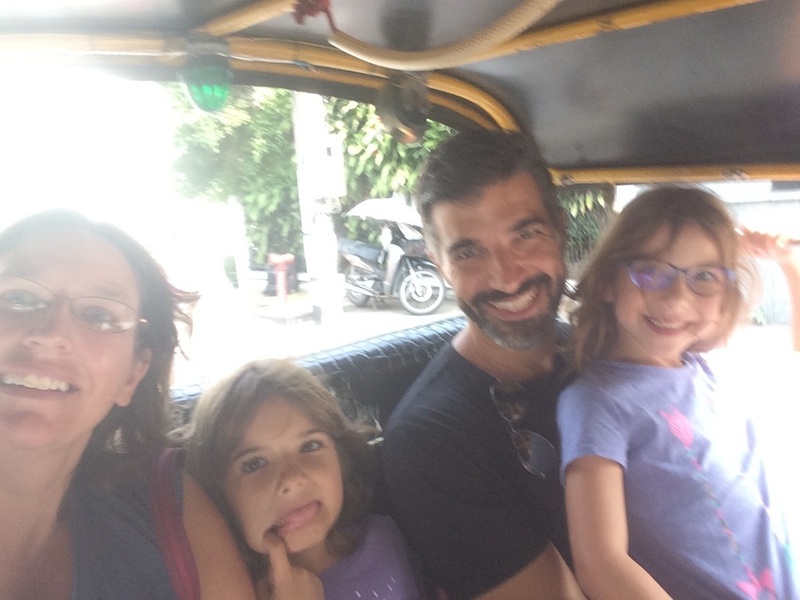 When we told the tuk-tuk driver to take us around the old city, he literally did just that – took us on the ring road around the outside of the old city. 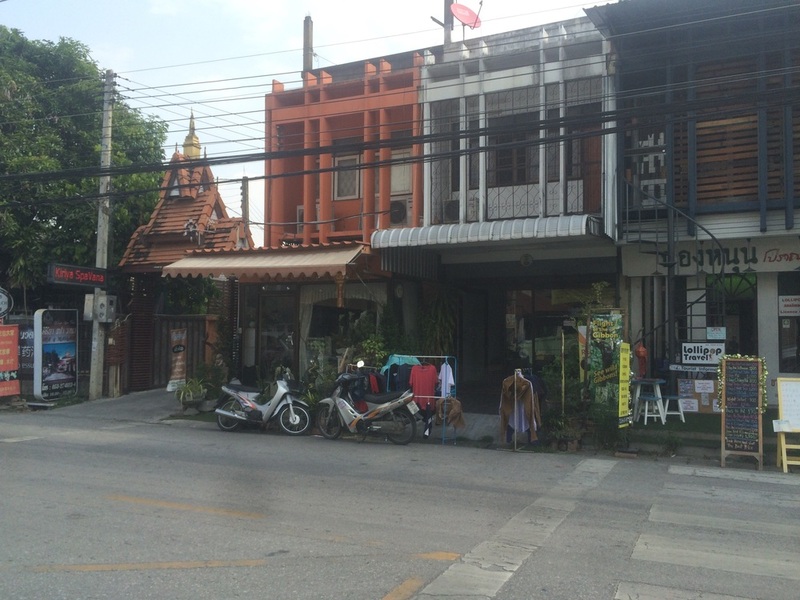 This part of Old Chiang Mai we explored by foot. Taking a tuk-tuk around Old Chiang Mai…the walled city. 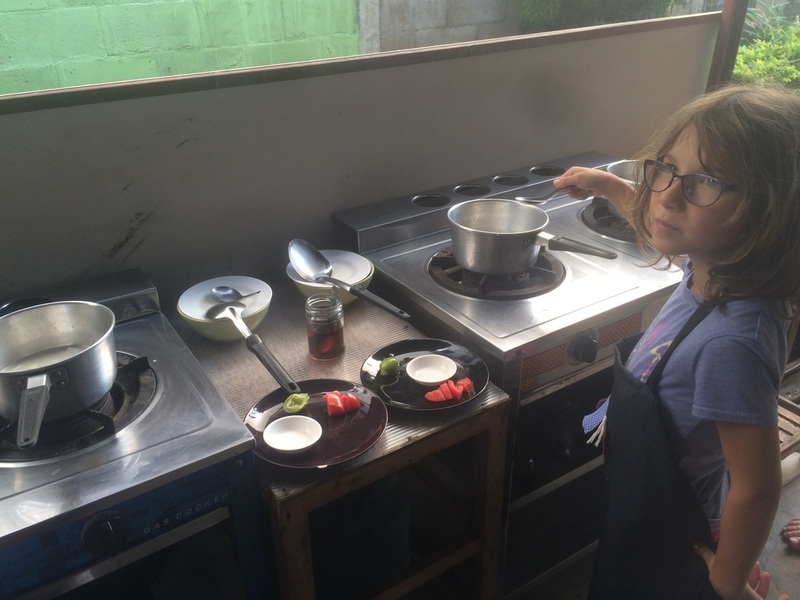 We spent the afternoon cooking Thai dishes, starting at the market and learning about the most common ingredients in Thai cooking. Everyone made 3 dishes: a soup, an appetizer, and a curry. We chopped the ingredients, used a mortar to make the curry, cooked over individual burners, and stuffed and rolled spring rolls (except for me…I made a chicken cashew dish instead. Hannah made banana spring rolls). At the end we all enjoyed some mango sticky rice, a popular dessert in Thailand. All four of us liked the class and the girls held their own, for the most part. 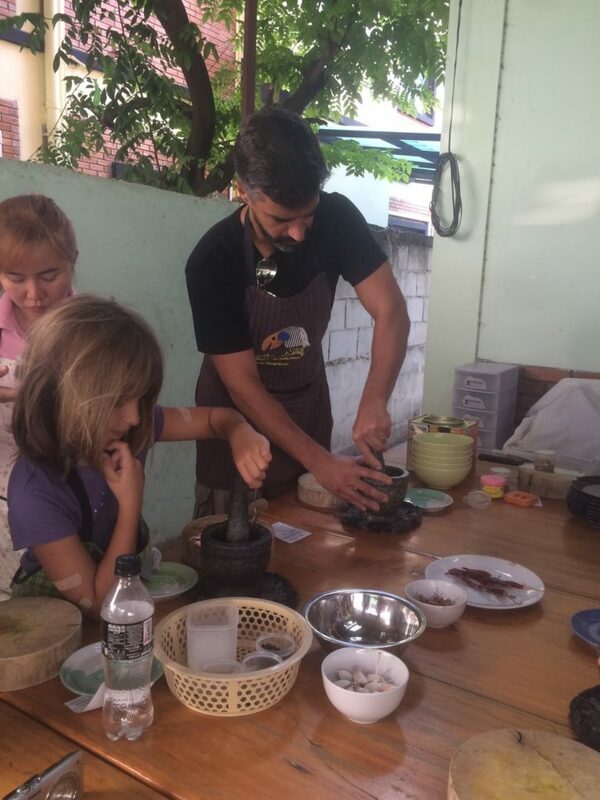 Our instructor introducing us to Thai ingredients. Anthony & Hannah making their curry paste. The next day, we were off bright and early to go to the Elephant Nature Park (ENP), about 1 1/2 hours north of Chiang Mai. 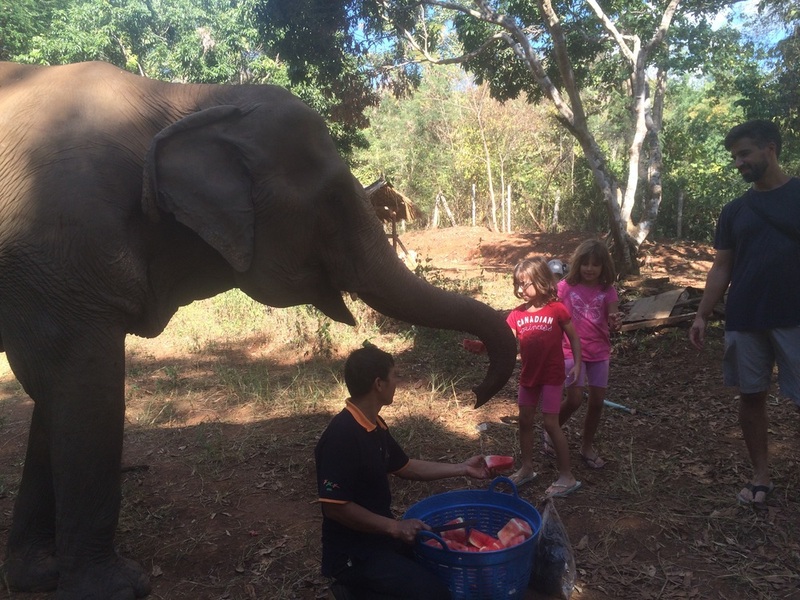 Over the course of a day and a half, we got to observe the elephants up close, as well as feed and bathe them. There are 3 elephants kept away from the others for various reasons. Some also had to have the rind cut off the watermelon because they’ve lost their teeth. ‘Bathing’ the elephants. Some had injured feet from stepping on land mines. Others had a broken back or leg, so couldn’t plunge right into the river. It was a much different experience from The David Sheldrick Wildlife Trust. 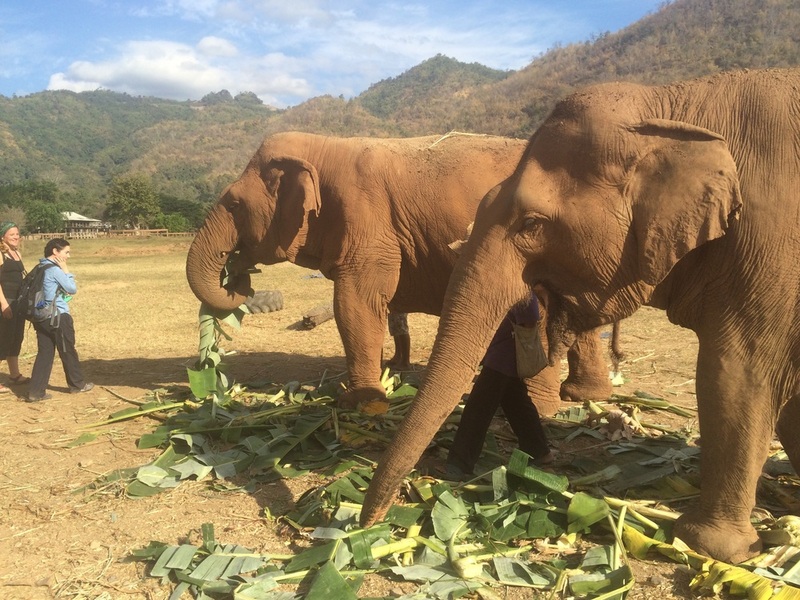 The ENP is more like a retirement place for older and injured elephants. They have yet to release any elephants back to the wild, but hope to release their first one this year. The one elephant is blind. The staff approximates the age of the elephant based on how deep the temples are. The deeper, the older. 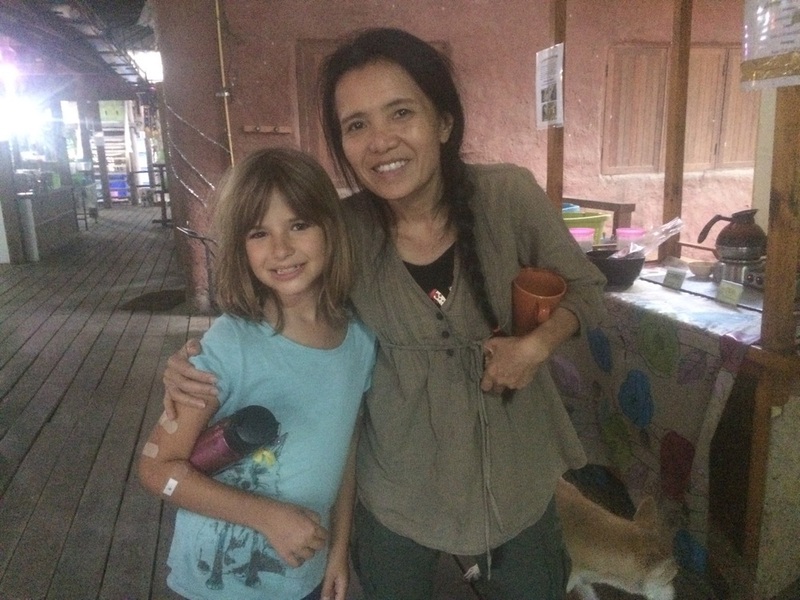 Hannah met the owner, Lek, and apparently Amy was giving our life’s story to Lek’s husband, a Canadian😀 The property also houses hundreds of dogs and cats, rescued from a flood in Bangkok. They are trying to find people to adopt the dogs. While we were there, Cat Kingdom was under quarantine, due to unexplained daily deaths, though Hannah still found a few to play with. Hannah & Lek, owner of Elephant Nature Park. Riding elephants is a no-no here, as their spirit must be broken before the elephants will carry people. 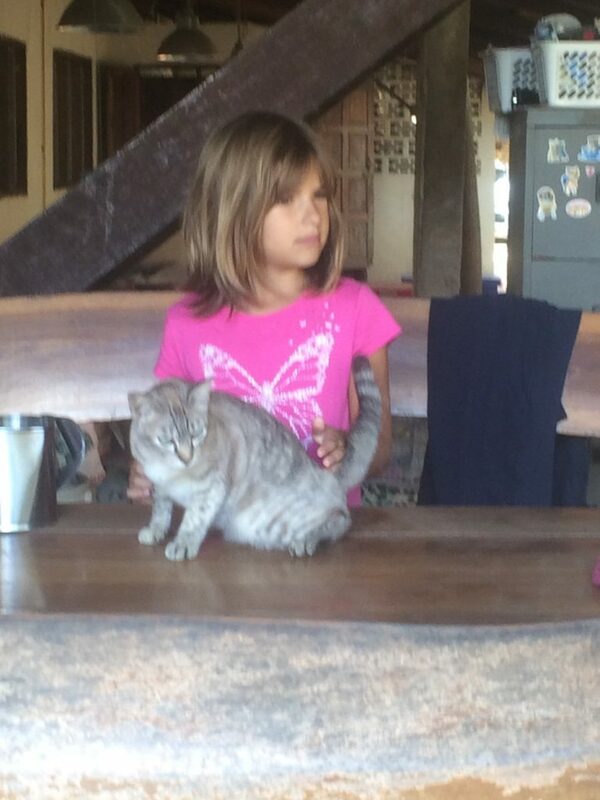 Hannah with one of the cats. Our spacious room was right by where the elephants spend their nights. It was quite something to wake up New Year’s Day to their trumpeting, rumbling, and squealing. It’s amazing the range of sounds they can make. An elephant keeper in Thailand is called a ‘mahout’. They carve their elephants out of wood to sell. 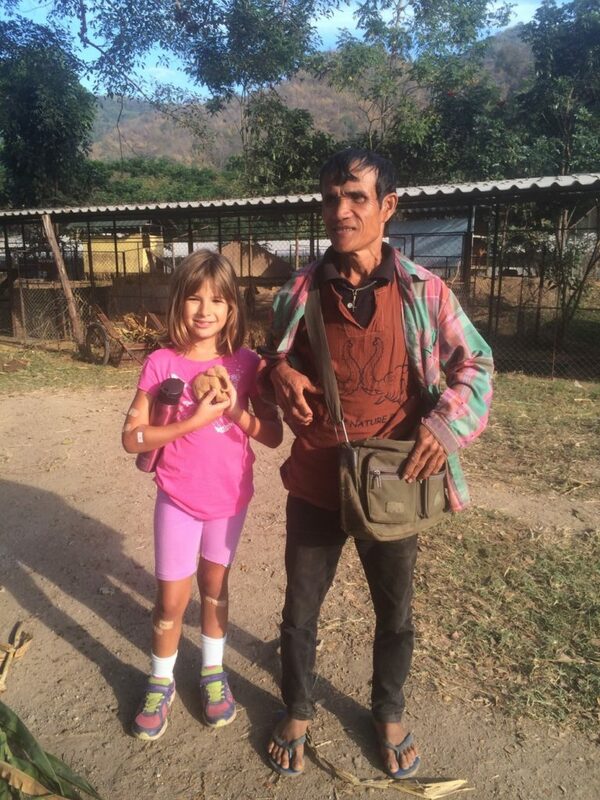 Hannah bought her’s from this mahout. 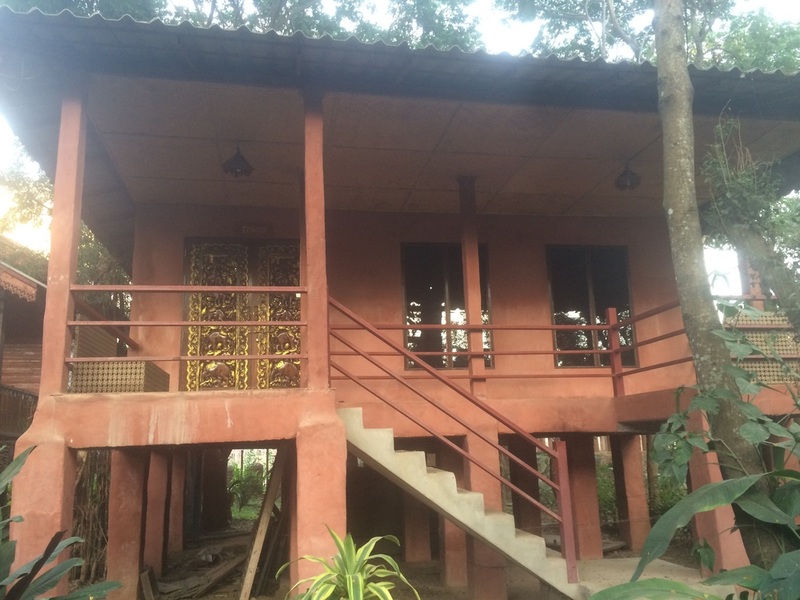 Our room at the Elephant Nature Park was as big as a small house! We arrived back in Chiang Mai New Year’s Night. Since our guesthouse didn’t have enough staff to serve dinner, we went next door to eat. As Anthony likes to say, he got sick from a restaurant in Chiang Mai but got better from street food in Bangkok. At 200,000 people (Thailand’s second largest city), Chiang Mai doesn’t even compare to the 10M+ metropolis that is Bangkok. 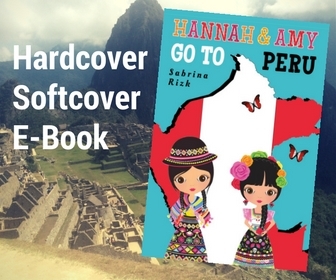 It seems to pretty much exist for tourists now. Now it’s back to Bangkok for a couple of days before heading to India. This trip is going by so fast! 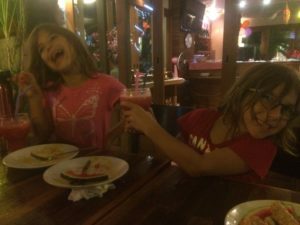 We are going to Chiang Mai this summer with our two kids similar in age. ENP offers so many tour options – any recommendations for which one is best for kids to enjoy(we aren’t staying overnight)? We did the overnight option, so it’s hard for me to say. I would definitely recommend one that includes a visit to the Elephant Nature Park. 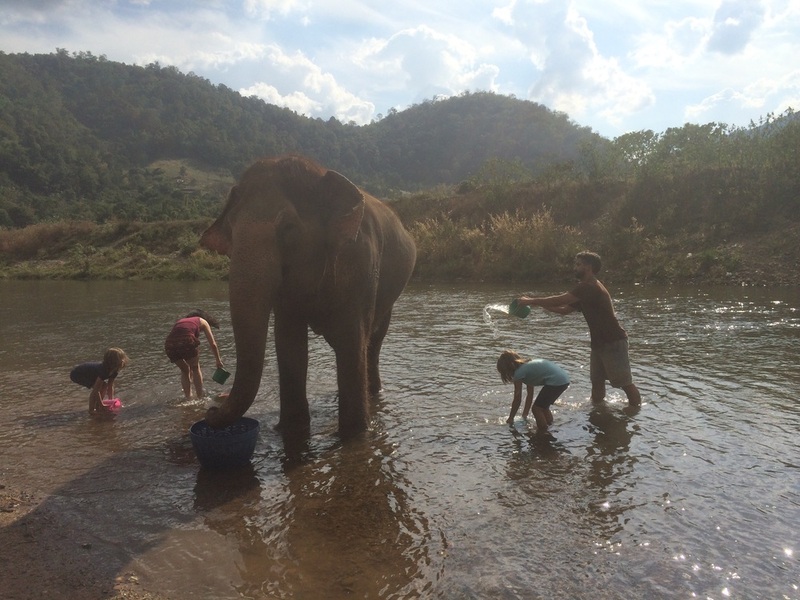 It depends on how much time you have and whether bathing the elephants is important to you. If it’s not, the single day or short park visit will work. If you and the family want to get away from the crowds and have a more intimate experience, then I would recommend one of the Saddle Off (North) experiences, but they are more expensive, so it depends on your budget.